Get the balance right with these transition tips to see you through the changing weather and into the brighter days. March 5 marks the start of Spring and, hopefully, the start of brighter weather. But there's still the occasional chill bound to blow in, so it's not quite time to ditch the layers. And with spring month not completely without occasional grey days and showers, it's best to stay flexible. A few new additions can ensure your outfit is on point. So here are our key spring fashion tips – to keep you well-prepared and wearing it well. Say goodbye to doom and gloom. Winter might have been all about dark colours, but we’re moving on and it’s time to be bold. The easiest way to transition into colour is to brighten up your outerwear. That way you can have a pop of colour every day without even putting much thought into it! Go for pretty pastels or if you’re feeling brave try something bold like this orange number from New Look. And as the weather picks up a bit, you’re no longer restricted to coats either. 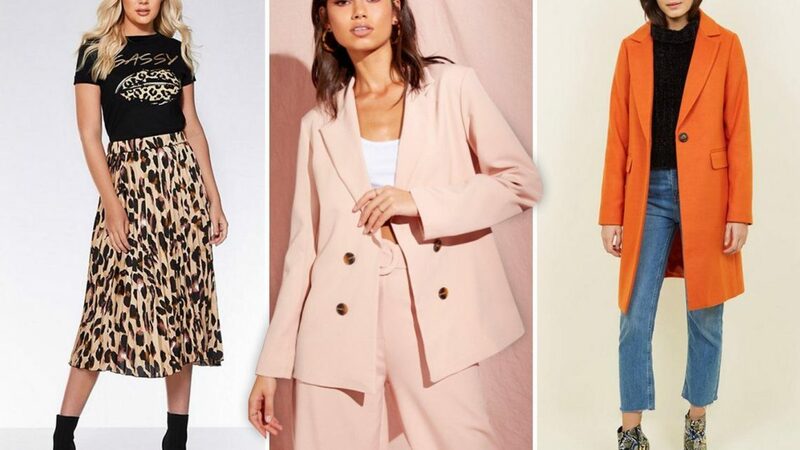 So it’s a great time to add a blazer to your collection – like this pretty pink one from Boohoo. Finally the time has come, you can start wearing skirts again without the need for thermal 200 denier tights. It’s still a bit nippy for miniskirts and bare legs – luckily maxi and midi skirts are all the rage, particularly pleated and silk ones. Stand out with bright colours or opt for a bold print – you can’t go wrong with a good animal print. To make up for a little leg being out in the cold, team your skirt up with a cosy jumper. And for extra-cold days add a leather jacket or coat on top. Putting a spring in your step doesn’t have to mean ditching the boots just yet. Ankle boots look great with any outfit and definitely shouldn’t be left out in the cold. Upgrade a classic by swapping your usual black boots for white. Or for something more casual, add a little colour with these Clarks cuties. If you’re ready to move on from boots but still want to keep those toes warm, you can’t go wrong with a chunky white trainer – they go with everything and white's great for spring fashion. Successfully dressing for spring is all about getting the layers right. Check the weather before swapping heavy coats for light jackets, and thick jeans for floaty trousers and skirts. Wearing white will make you feel fresh and spring-y. Even if you’re bundled up in white jeans and a roll neck, you’ll still be looking ready for the season. Switch up your accessories – pack away the thick scarfs and trade them in for sunglasses. Spring usually means florals, but it doesn’t have to. Don’t be afraid to try out a variety of colours and prints – be bold! Power up your work wardrobe for spring with structured frocks and sharp suits. You can now buy £7 tights that come in different waistband widths for women of all sizes. £29 leopard print charity T-shirt sold out in just one day… but it WILL be back in stock.